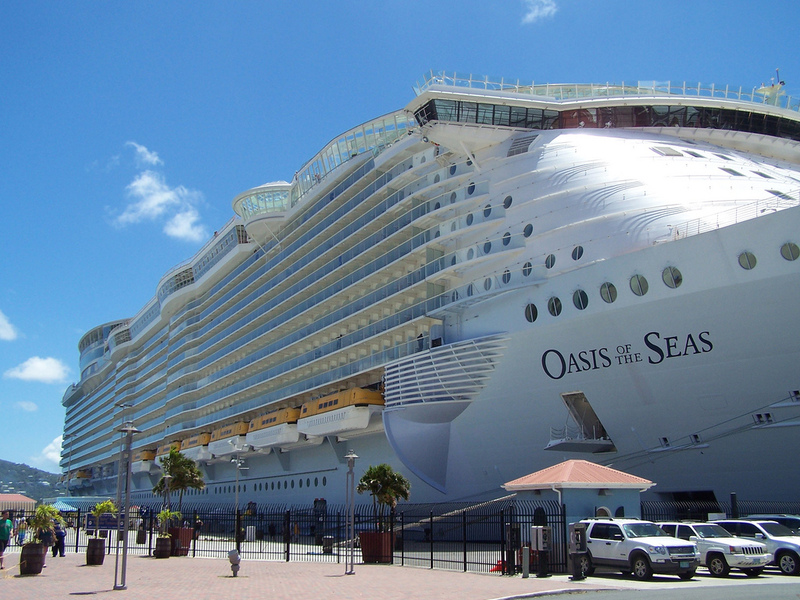 Oasis of the Seas is a gigantic cruise ship. 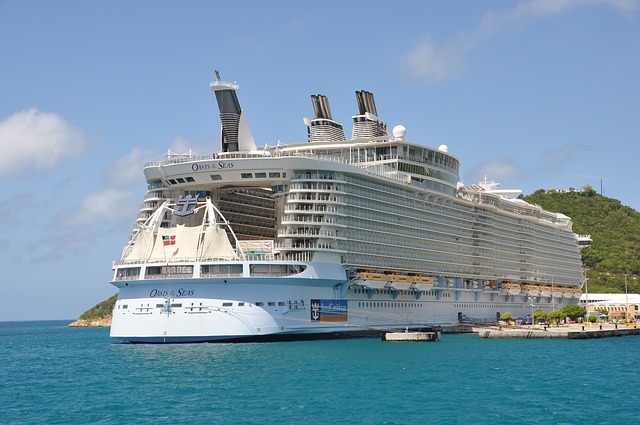 In fact, Oasis, along with its sister ships, Allure of the Seas and Harmony of the Seas, together make the world's biggest passenger cruise ships. I know your family will enjoy sailing to the Caribbean aboard the beautiful Oasis. Oasis, which is owned by Royal Caribbean International, measures 225,282 tons and has an actual displacement mass of 100,000 tons. If you are wondering whether your family will be comfortable onboard this huge cruise ship, there is no need to worry. Oasis of the Seas was built with a wide hull to help with stability plus about 30 feet of the ship's base lies beneath the surface of the sea. 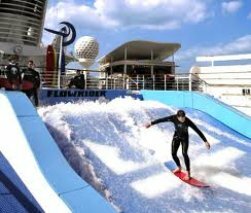 Officers of Royal Caribbean testified to the ship's superb stability and performance while it crossed the Atlantic Ocean to its new home in Port Everglades, Fort Lauderdale, Florida in 2009. Yes, you can book an inclusive family Caribbean cruise via the Oasis to the islands of the Caribbean. 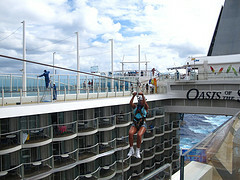 Oasis sailed its maiden voyage on December 5, 2009 and has since set a world record for carrying 6,000 passengers. The ship has accommodations for 6,296 passengers and 2,165 crew members. As you can imagine that with a huge ship come many amenities. Oasis has enough treats to spoil your family rotten and have you coming back for more. *Special features in suite offerings include two-story lofts and luxury suites reaching up 1,600 sq. ft.
Additionally, these suites have balconies which overlook the sea or promenades. *Accommodations include nurseries for your kids. Wow! "Fun and entertainment" are organized into areas called "neighborhoods". 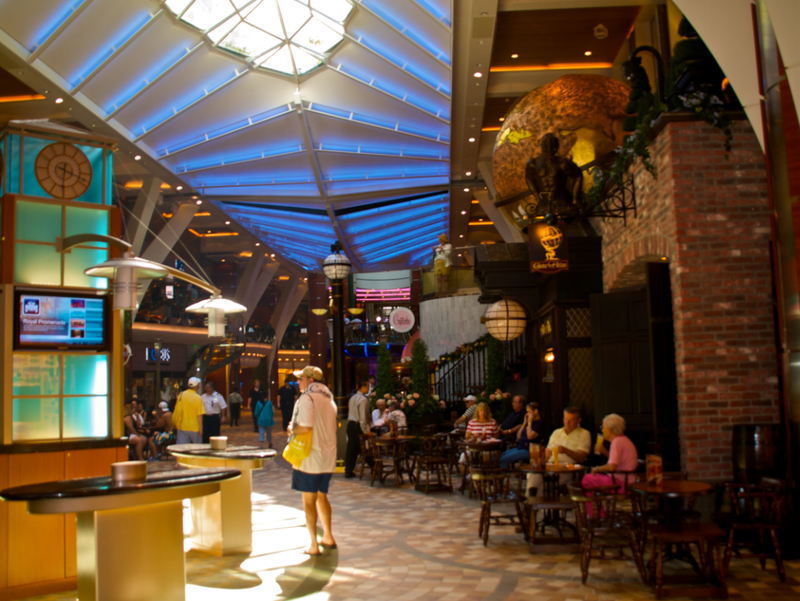 There are seven such neighborhoods on the Oasis of the Seas. This features a carousel, restaurants, bars, shops, two rock-climbing walls and a temporary tattoo parlor. There is also a 750-seat AquaTheatre amphitheater (outdoor), which hosts Oasis' largest freshwater pool. Here you will find boutiques, restaurants and bars, including access to the Rising Tide bar, which can be raised or lowered to three separate levels. The Central Park neighborhood has the first living park at sea with over 12,000 plants and 56 trees. Find Casino Royale, Studio B (featuring ice shows), night clubs and a comedy club. Get your share of a sloped-entry beach pool and two surf simulators. This features restaurants and shops which are viewable from a mezzanine. Can you believe this? Your teens have their own spa. Added to that there is a Youth Zone. This features a science lab, computer gaming, an open gym and activity center. To top it all off, the Oasis of the Seas now offers the "DreamWorks® Experience". Your entire family can create lasting moments with their favorite characters from shows such as Shrek®, Madagascar(TM) and Kung Fu Panda(TM). Everyone can pose for pictures with the characters, interact with them during meals, laugh at their madness during parades and watch their movies in a new 3D theaters - at no extra charge. If I should attempt to sum it all up, here it is: Oasis offers great accommodations, nurseries for children, too many restaurants, fun spots for all kids, a casino, a mini-golf course, multiple nightclubs, several bars and lounges, a karaoke club, comedy club, five swimming pools, volleyball and basketball courts and "theme parks". What are you waiting for? Are you ready to book? Let us look at some available sailings for the Oasis. As noted previously, the ship's homeport is Port Everglades in Fort Lauderdale, Florida. 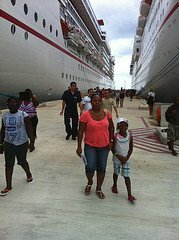 Below is a list of inclusive family Caribbean cruise sailings via Oasis. 1. 7 Night Western Caribbean Cruises from Port Canaveral, Florida to Labadee, Haiti; Falmouth, Jamaica; and Cozumel, Mexico - At least one sailing per month. 2. 7 Night Eastern Caribbean Cruises from Port Canaveral, Florida to Nassau, Bahamas; Charlotte Amalie, St. Thomas; and Philipsburg, St. Maarten - at least two sailings per month. Booking an inclusive Oasis cruise ship vacation is easy. Finally, you may call the cruise line directly to book your inclusive Oasis Caribbean cruise getaway. Without a doubt, your family will make lasting memories on this mammoth and beautiful, floating luxury resort at sea. Do not hesitate to make plans to get aboard. Here is one more picture that I had to throw in. 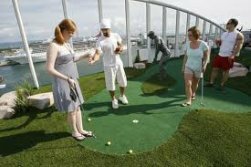 Can you imagine such a golf course at sea? You will find it on Oasis of the Seas.